Heavily inspired by the New York Times’ incredible A Map of Every Building in America, we have created Every Building in the Greater Toronto and Hamilton Area (GTHA). Being familiar with the City of Toronto’s Open Data Portal (it basically makes our world go ‘round) we knew that one of the coolest open datasets offered by the City is the 3D Massing file – a detailed three-dimensional spatial dataset that contains almost every building across the city. Having explored that file extensively, we realized we hadn’t taken advantage of similar open data made available by neighbouring municipalities. Finding out initially that Mississauga had similar data available, we were encouraged to continue investigating and gradually we started to combine building footprints for almost all municipalities in the region. Below is a list of the municipalities and regions offering their own version of openly available building footprints. Unfortunately, we could not find any data for the northern part of Halton Region (Milton and Halton Hills). Over the past couple weeks we’ve been exploring the integrated dataset and identifying interesting and unique buildings as well as looking for patterns that come through across the region. Please let us know if you see anything interesting! The map was created using QGIS, Mapbox, Turf, and tippecanoe. 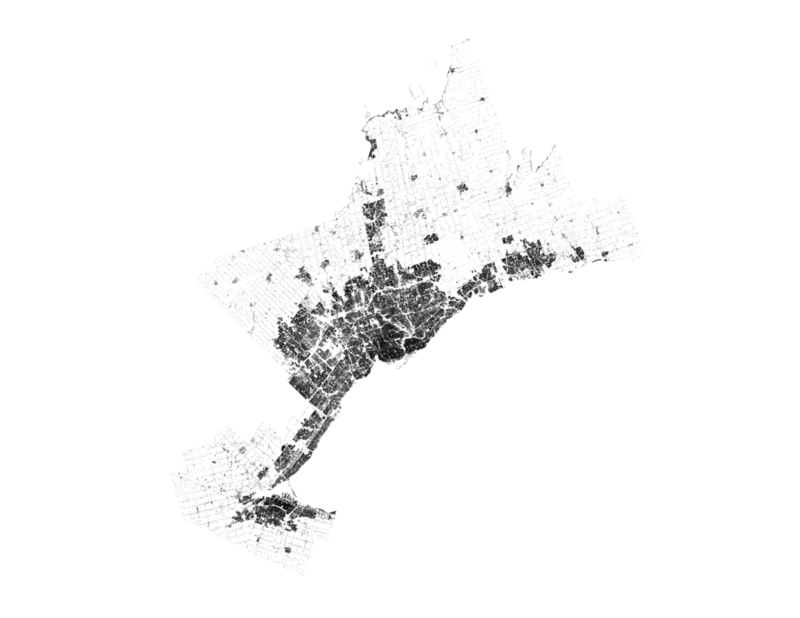 We followed this tutorial written by Lo Bénichou to upload the large building footprint geojson. A big thanks to Lo for helping us customize our tippecanoe commands based on our needs. All of the code used in the map above is hosted on GitHub here.